Bernhard Wöstheinrich really puts the "extra" in extraterrestrial. Suspicions of his unearthly origins will be upheld upon listening to Elsewhere (68'44"), an album of Electronic Music that confirms his expanded ideas of the cosmos and infinite space. 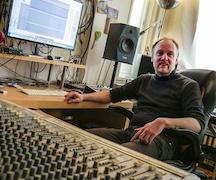 The classic works of the original Berlin-School have nothing to fear, as Wöstheinrich is more comfortable with self-expression than with translation. This wayward album will arouse the imagination of listeners, as it explores an aural space along contours which remain obscure. Sounds arise, vibrate, and recede, but do not travel along a linear plane. Conveying a unique ambiance the mood moves through a vast emptiness. The upper strings tremble over a thickening bass, then, with cold deliberate pressure, chase the harmonies into an upper atmosphere. With echoing patterns of sequencer notes, we are treated to a delightful acceleration in energy. Repeating motifs motor up, propelling us through distant starlit stretches - then reorder down into a languid drift. As the spacey lines meet, combine, and evaporate each of the four tracks move into a distinctive section of stillness. In tones edged in platinum Elsewhere rings of a far-ranging sonic intelligence - which is felt in its unrestrained directness of expression. 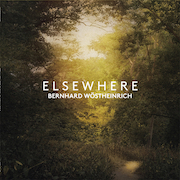 By overcoming the limitations of contemporary music Bernhard Wöstheinrich better expresses his un-conforming ideas. Existing in stark contrast to the mainstream, Elsewhere communicates the harsh and heavy reason for staying awake in a world of the self-anesthetized.